I am currently doing some research into the history of the Grand River land grants made to the Six Nations after the U.S. Revolutionary War. The village of Conestogo sits on these lands – not to mention many of the cities and towns up and down the Grand River Valley: Kitchener, Cambridge, Brantford, Elora, Fergus, and many others. This research sheds new light (for me) on the history of the entire northeastern part of North America from roughly 1600 to the mid 1800s – a critical period of about 250 years. As usual with most historical accounts the focus is mostly on battles between conflicting groups of people – winners and losers – but mostly the winners. In the case of the Iroquois it was an ongoing struggle to maintain control of the trade between first nations, the French, Dutch and British during this period. They ran what some historians consider an “empire” – the Iroquois League. The Iroquois League (or “Confederacy”) was located in upstate New York and was formed sometime between 1390 and 1570 (the date is uncertain). The term “Iroquois” is a French-ified version of the name used by their allies the Hurons. It meant “rattlesnakes”. The Iroquois refer to themselves as Haudenosaunee. Jacques Cartier had seen Iroquois villages up and down the St. Lawrence in 1541-42, but these were gone by the time Champlain visited the St. Lawrence in 1603. Some historians speculate that the Iroquois from the St. Lawrence migrated to upstate New York. But the relationship between these Iroquois and those in New York is not clear. What is generally accepted is that the Iroquois League had developed long before 1600. 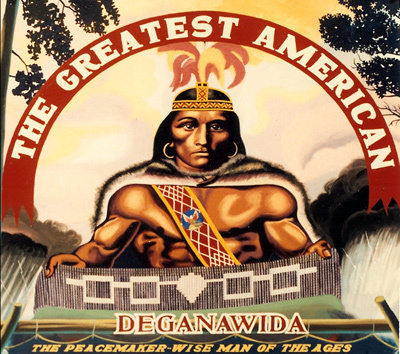 Deganawide, the “Peacemaker”, is said to have inspired Haiawatha to bring the Iroquois together to form the Iroquois League. Legend has it that two famous natives were involved in the formation of the Confederacy: Deganawide, known as the “Peacemaker”, and Hiawatha (or Ayewentha) an Onondega who had become a Mohawk chief. Together they convinced the other Iroquois chiefs to form a cooperative league in which they pledged never to kill each other. The original confederacy was formed by an alliance between the Mohawk and Oneida in the eastern part of their territory, and the Seneca, Cayuga and Onandaga in the west. The Tuscarora nation joined in 1722 after they were forced to leave North Carolina. This resulted in significant cooperation and gave the Iroquois considerable military and political power. As a result of their cooperation they were able to dominate (or subjugate) many of the neighbouring tribes right across the northeastern part of the continent. At various times their control extended as far north as parts of Ontario and Quebec, and as far west as the Ohio valley. They did this by a rigorous policy of adoption from other tribes. As others were defeated in battle many of the warriors were simply captured and “adopted” into their own ranks. Other tribes such as the Mingo, Mahican and Delaware were given membership in what was called the “Covenant Chain”. This made them allies, and gave the Iroquois the right to bargain with the Europeans on their behalf. But in the eyes of the Iroquois these tribes were second class citizens. Since its beginning the council fire of the confederacy had been burning at the main Onondaga village near present day Syracuse. But a series of complex events led to the splintering of the confederacy and the extinguishing of the council fire in 1777. The event that divided the Six Nations was the American Revolutionary War. The main character in this part of Iroquois history was Joseph Brant, an influential Mohawk also known as Thayendanega. Joseph Brant sided with the British in the Revolutionary War and was instrumental in splitting the Iroquois League. Brant had been taken under the wing of William Johnston, the British Indian commissioner. He had attended English schools, married Johston’s daughter (Molly) and even accepted a captain’s commission in the British army. Eventually he rose to a position of leadership with the Mohawks. Not surprisingly Brant sided with the British in the conflicts that led up to the Revolutionary War. When the Iroquois League council decided to remain neutral between the British and Americans Brant opposed them. He was convinced that if the Americans won their independence the Iroquois would lose their lands completely. As a result Brant led his own warriors against the Americans in a series of brutal battles between 1776 and 1783. Iroquois who had been allies for centuries now ended up fighting and killing each other in a war between two imperial powers to decide who would carve up the continent. At the end of the war Brant led his warriors into Canada to the Grand River where the Six Nations confederation was reconstituted. For their loyal service to the British, Brant and his followers had been given 675,000 acres of land stretching along both sides of the Grand River in southern Ontario. Approximately 2,000 Iroquois followed Brant to Canada. Most of them were Mohawk and Cayuga, but there were also remnants of all six Iroquois nations. In New York the remaining Iroquois were considered a “conquered people” even though many of them had supported the American side during the war. As Brant had anticipated, they were forced to give up most of their land and were confined to a few small reservations. Now two Iroquois confederacy council fires were burning – one in Ontario and another in New York. Initial cooperation between the two groups eventually ended around 1803. In the process of doing the research for this article I stumbled onto this very detailed history of the Iroquois Confederacy written and compiled by Lee Sultzman. Native American History, by Judith Nies – puts Native American History into the context of world history. In the Hands of the Great Spirit, by Jake Page – has a detailed description of the Haiawatha legend and the formation of the Iroquois League. wampumWithin the clans of the Haudenosaunee all leadership members hold equal powers and are accountable to everyone. The Clan Mother, usually the eldest woman in a clan, holds a leadership role and has the power to choose and depose a Chief. Taking into account all she knows about the candidate in his dealings throughout his life she decides who is a good fit to represent the clan. The Chief (154kb/1sec)sound bite is responsible for the welfare of his nation and represents the opinions and issues of all those concerned. Within the system there is also a female and male Faith Keeper, both of whom are responsible for acting as spiritual guides for the people. The Faith Keepers are in charge of conducting seasonal ceremonies and the Four Sacred Rituals. Though the Chief, Clan Mother (154kb/1sec)sound bite and Faith Keepers all have leadership roles they must work together to maintain a balance of power and they are all accountable to their clan. Clan CircleAmong the Haudenosaunee are groups of people who come together as families called clan (143kb/1sec)sound bite. As a matrilineal society, each clan is linked by a common female ancestor with women possessing a leadership role within the clan. The number of clans varies among the nations with the Mohawk only having three to the Oneida having eight. The clans are represented by birds and animals and are divided into the three elements: water, land and air. The bear, wolf and deer represent the land element, the turtle, eel and beaver represent the water element and the snipe, hawk and heron represent the air element. Each member of a clan is considered a relative regardless of which nation they belong to. A wolf clan member of the Mohawk and a wolf clan member of the Seneca nation are still considered relatives. Family names and clans are passed down from mother to child. For example if a man belonging to the turtle clan were to marry a woman of the wolf clan the children would be of the wolf clan. The Iakoiane or Clan Mother (156kb/1sec)sound bite, a title which is passed down hereditarily through a clan. Among the five nations of the confederacy there are nine Mohawk Clan Mothers, nine Oneida, thirteen Onondaga, ten Cayuga and eight Seneca for a total of forty-nine Clan Mothers. It is her responsibility to look out for the welfare of the clan by overseeing the actions of the Chief and ensuring that he is performing his duties in accordance with the Great Law. As Clan Mother she will have her own wampum of two strings, one white and one purple, signifying her title within the Haudenosaunee. Should she pass on, the string will then be passed on to the next hereditary Clan Mother. When a Chief passes away a Clan Mother selects a candidate to replace him hopefully within three days of the funeral though this process can take much longer. She will choose the candidate and present him to her nation. This candidate is then presented to their brother nation for approval. If approved the candidate is presented to all other members of Grand Council for approval before a Condolence ceremony may begin to raise up the new Chief. The Chief Todaharo (144kb/1sec)sound bite does not have a Clan Mother which is why there are only 49 Clan Mothers yet 50 Chiefs. In the case of replacing him the Onondaga Chiefs will all decide on a candidate while taking into consideration the advice of all the Clan Mothers. The old chief, Clinton Rickard, lived in a little house near the Niagara County town of Sanborn on the reservation of his nation, the Tuscaroras. People of the Iroquois Confederacy will always remember that house not merely because Clinton Rickard had done many good things for his people in his long lifetime, but because at his invitation, another fine man, a homeless exile, lived out his last days there. Though his name is known to few white people, no loyal Iroquois will forget Deskaheh, Chief of the Younger Bear Clan of the Cayuga Nation. Deskaheh was a descendent of Mary Jimerson, famous in Indian and colonial history, and he was born in Grand River Land, a reservation of the Six Nations People who fled or were driven to British lands, now Canada, from their lands below the border after the American Revolution. They chose these acres, gratefully guaranteed to them by the British through General Haldimand, because the Grand River, with its level flats, reminded them of their beloved lands taken over by New York State. After his years of grammar school, Deskaheh, like many other Grand River people, exercised his rights, guaranteed by the Jay Treaty to cross the U.S. boundary to become a lumberjack in the Allegheny Mountains, but after an accident, he returned to Grand River and took up farming. He married the daughter of a Cayuga mother and white father and she bore him four daughters and five sons. By 1914, Deskaheh had reached the middle period of what white neighbors called a “successful reservation Indian life.” His honesty, sincerity and his ability as an orator in Cayuga language had brought him deserved appointment as head speaker when the Canadian Government, satisfied until the beginning of World War I to allow the Iroquois the status of a separate nation, decided on grounds of expediency to disregard the old treaties and assimilate the Indians, by force, if necessary. Deskaheh was the leader of the delegation that patiently explained in Ottawa, first, that the Canadian Government had no jurisdiction over the little Iroquois nation, and second, that since the Indians had already volunteered in proportionately greater numbers than the people of any other nation in the world, enforced draft of its young men by a foreign ally would seem silly. They won this argument, but the end of the war brought other attempted encroachment and the Iroquois soon knew that the majority in the legislative halls of the Canadian capitol planned further inroads on their rights as citizens of the separate country known as Grand River Land. In 1921, to thwart the purposes of these schemers, Deskaheh, appointed “Speaker of the Six Nations Council,” presented as travel credentials a passport authorized by his nation and crossed the Atlantic to seek British aid. Since, as he pointed out, the treaty by which his people had their rights guaranteed was signed by George III, he asked its confirmation by George V. The English authorities refused his request saying that they would not deal with a Canadian domestic problem and the Cayuga returned, disillusioned. Then the Canadian enemies grew bolder. The creating of a fifth-column party through persuasion, promises, and payments was easy. It was easier still to get the new minority to ask for protection. And it was easiest of all to order a detail of the red-jacketed Royal Canadian Mounted Police to ride into the Grand River country to protect the “loyalist” Indians and “to keep the peace.” So obvious was this procedure that Deskaheh, who strongly opposed it, pleading earnestly for arbitration, won many sympathizers among his neighbors and through them, news of the coming raid reached him in time for a hasty flight across the border of the United States to the city of Rochester in western New York State. The raiders arrested and jailed a number of Iroquois, and though Deskaheh was known to abstain from alcoholic liquors, they searched his house on the pretext of looking for illegal beverages. The Canadian Government then ordered barracks built for the housing of their police and Grand River was suddenly an occupied nation. Deskaheh now began to fight back desperately. By June, he had obtained the services of a Swiss lawyer who was preparing a statement of the case of the Six Nations in French. The money the Indians and their friends had raised in North America was almost gone, and some means of replenishing it was necessary. The Cayuga was also attracting much favorable attention as a person. To the Irish woman correspondent of the Freeman’s Journal he seemed a “good-looking, broad-shouldered man, about 40 years of age (he was actually 54) wearing ordinary dark clothes…and presenting every appearance of a well-to-do farmer with the one exception of his beautiful moccasins…” She commented on the penetrating searching glance of his dark eyes, his kindly smile disclosing remarkable white teeth, and finished her description with the sentence “His beautifully shaped but stern mouth, firm chin and heavy jawbones are those of the born fighter, the strong man who knows his strength and believes in it, whilst his shining eyes speak of enthusiasm and idealism.” But in the middle of this enthusiastic and sentimental interview, the chief had persuaded her to quote from the text of a memorial address to the Grand River Indians, dated as late as December 4, 19I2 and filed by Great Britain. Time wore on and though a few Englishmen and Canadians spoke up for the Six Nations Indians, though the representatives of the Netherlands and Albania Iistened sympathetically and spoke of supporting his petition, Deskaheh began to suspect that his cause was lost. News from the homeland was bad. The Canadian Government had announced a “free election,” which would in effect determine whether or not the Six Nations Government of Grand River Land should be dissolved. For this vote, the Canadian Government agent had taken possession of the Six Nations Council House, surrounding it with a guard of twenty police. In protest, the Indians favoring their nation’s continuance did not vote. The Canadian authorities then broke open the safe holding the records of the Six Nations and took from there a number of wampum belts, revered as sacred by the Iroquois, refusing, on demand, to return them. In November 1924, Deskaheh wrote to the editor of a Swiss journal, “it is the heart broken that I must affirm that since several months I am against the most cruel indifference…My appeal to the Society of Nations has not been heard, and nothing in the attitude of Government does not leave me any hope. As if to seal its own lack of interest, the Secretariat of the League which had notified Deskaheh of the refusal to allow him to appear as a petitioner before a plenary session, aware of the embarrassment he had caused, now denied both Deskaheh and George Decker seats in the gallery to observe deliberations. Despairing, the two friends struck their last brave blow. They hired the Salle Centrale, and advertised in the press their own meeting at which Deskaheh would present the case to those who would come to listen. The response was amazing. The North American “Indian” had been a popular figure in Europe since the time of Columbus and, the populace, the vast majority of whom had never seen an example of the noble savage as popularized by translations from the works of James Fenimore Cooper and other romanticists, attended in thousands. All the Geneva Boy Scouts were present, but not a single League of Nations Official. Members of the press of many nations, sensing possibilities of stories about a picturesque if not politically important character, were at their reserved tables, among them the distinguished Hungarian journalist Aloys Derso, who told amusing and movingly pathetic incidents of the occasion. “I went to the evening to see my first American Indian. He was in the dressing room already in full regalia. I drew a few sketches of him and he was a good model, sitting immobile. He had not the typical Indian profile, the nose not the aquiline nose I had expected. His eyes were tired and there was a great melancholy in his expression”. When Deskaheh appeared before the great audience, he walked in dignity and with no self-consciousness. There were giggles because, though in the elaborate dress of a Chief of the Cayuga Nation, he carried an enormous yellow suitcase which he placed carefully on a table in front of him. Then he recited the tale of the broken pledge, the raid of the Royal Mounted Police, the rummaging of his own house, the building of the police barracks, the seizure of the sacred wampum. The story would be incredible without evidence, he said. but he had foreseen this and had the proofs with him. Then he lifted the lid of the suitcase and with care and reverence drew from within the old headed wampum on which might be read the sworn agreements of’ white governments with his people. Speaking with deep feeling, translating these documents slowly and impressively, stopping now and then to make clear the meanings of the bead colors and of the representations of the symbols, he made his entranced listeners feel that this was not the narration of the grievances of a small racial unit, but the story of all minority peoples – the tragedy of every small nation that is a neighbor to a larger one. When he finished, there was a moment of silence – then a roar of a tremendous ovation. Thousands rose to their feet to cheer him and the great hall echoed and re-echoed with their applause. Straight, unsmiling, impassive, he waited until after many minutes the sound began to wane. Then, still expressionless he left the platform. Before the end of 1924, the Speaker of the Six Nations Council had returned to the United States, a disillusioned and discouraged man. An exile from Canada and from the nation he thought he had failed, he found refuge with Clinton Rickard in the house of the benign old chief. There, by the Niagara River, which marks the Canadian boundary, he found that the people for whom he had fought did not think him a failure. From their northern homes in Grand River Land, they journeyed here to see him and assure him of their loyalty. Though his disheartening experience had weakened him physically, his spirit took fire from their words and with never-ending courage, he kept up his battle. NOTE: This is an exerpt from “Basic Call to Consciousness”. The Six Nations is a confederacy, or league of nations, comprised of the Mohawk, Oneida, Onondaga, Cayuga, Seneca and Tuscarora nations. Each nation speaks its own dialect of the same language group. This league of nations did not originally include the Tuscarora, and is said to have formed before European contact with the Americas, sometime around the year 1450. The traditional account of how the Iroquois Confederacy was formed involves a man known as “the Peacemaker” who brought teachings of good news, peace and power, which were accepted by the people and became known henceforward as “The Great Law of Peace.” Fifty chiefs, clanmothers and faithkeepers, each with respective jobs, were appointed to as caretakers of the law. Chiefs are to pass their name down to their successors, who are chosen by the clanmothers, as they are head women of each respective clan. It is in this way that the Great Law is perpetuated and remains intact and alive today. Haudenosaunee people are traditionally a matrilineal society, which means that clan and nation are passed down to a child from his or her mother, and not from the father. People from the same clan are not allowed to marry one another, as clan constitutes a familial relationship already. Originally, the Haudenosaunee people occupied territory from Montreal south to the Finger Lakes region of New York State. After siding with the British during the American Revolution, King George III awarded to the Haudenosaunee land along the Grand River a tract of land which designated six miles on both sides of the Grand River from mouth to source upon which many Haudenosaunee would settle. In 1785, this tract known as the Haldimand Deed encompassed approximately 300, 000 square hectares. However, during the ensuing years, more than half of the land was settled by the Scottish, Pennsylvania Mennonite exiles and United Empire Loyalists. Today, only 18, 000 square hectares remain with the Six Nations.” Presently, the Haudenosaunee occupy land in New York State, Quebec, Ontario, Wisconsin, and Oklahoma. Historically, the Iroquois did not live in teepees, but in longhouses made of wood. These houses were large enough to house several families of one clan. Today, longhouses are used not as places of dwelling but as a place of giving thanks and ceremony. The longhouse religion is the traditional religion of the Haudenosaunee people. There are also many churches situated on the Six Nations Reserve. Longhouse ceremonies are largely based on thanking our Creator (God) for the products of the earth, the seasons and our livelihoods. There are regular ceremonies for thanksgiving. These include the Maple, to give thanks to the maple trees for yielding their sap; Planting to ask the Creator to bless the seeds of the new crops and promote fertility; Strawberry acknowledges and gives thanks to the first fruits of the earth; Green Corn celebrates and gives thanks for the ripening of the corn, beans and squashes, the three sisters; Harvest is a general thanksgiving to “Our Supporters” after the harvest has been gathered; and finally the Midwinter is a ceremony for the purpose of celebrating the renewal of life and giving thanks for it. These ceremonies are conducted on an annual basis to give thanks. The ancient and traditional calendar was measured using lunar cycles which may be counted using the plates on the back of a turtle’s shell. There are thirteen plates in the center of the carapace, and twenty-eight surrounding smaller ones. These can be used to count the thirteen full moons of the year, and also the twenty-eight days of each lunar cycle. Historically, contracts, political alliances were solidified and special events were marked by the exchange or presentation of wampum beads, which were often woven into belts or onto a single string. Wampum is made of beads made from the shells of spiral fresh-water shells. The laws of the original confederacy are recorded on wampum belts which may be interpreted accordingly. Wampum belts are made up of “Cylindrical beads (made principally of Quawg, Venus Mercenaria, shells) drilled through from opposite ends,” and strung in rows with sinew, vegetable fiber and or thread, forming a rectangular belt that is usually longer than wide. The beads are deep purple or white in color. In 1609-10, Samuel de Champlain made an alliance with the Hurons, and together they made war upon several groups of Iroquois at the Battle of Richelieu and the Battle of Lake Champlain. French-Iroquois relations remained tenuous for centuries afterward. However, the Iroquois established positive relations with other European groups who provided them in turn with trade goods and European supplies. In 1643, the Iroquois concluded an important treaty with the Dutch allowing for the two cultures to live parallel to one another, without interfering with the other. This contract is known as the Two-Row Wampum belt, which signifies two rivers running parallel but never intersecting. When the British later conquered the Dutch colony of New Netherland and renamed it New York, they inherited and continued the alliance with the Iroquois. The Haudenosaunee relations with the British were generally sort of alliance with trade relations as well. As European contact continues, missionaries from various countries and sects of Christianity were sent to convert the local Haudenosaunee population. Several Jesuit priests are often cited to illustrate this. In 1649, the Jesuit preists Jean de Brebeuf and Gabriel Lalemant were martyred in Brantford… Information gathered by the Jesuits is documented in their journals. These firsthand accounts may be read in Jesuit Relations and des peres Jesuites. The new European population settling in the Americas brought new diseases to which the Haudenosaunee and all indigenous populations had no resistance. Aboriginal people suffered from epidemic diseases they knew no cures for, such as smallpox, the common cold, measles, influenza, tuberculosis and cholera. With severely decimated population, the Haudenosaunee people were easier to annex from the new European settler population. The seventeenth century was one of plagues and decimation for the Haudenosaunee. Although the British and Iroquois had been allies in the American Revolution, the British had signed the Treaty of Paris in 1783, which ended the war with the United States. Many of the Haudenosaunee regarded their ally’s signing of this treaty with their enemy as a betrayal of their alliance. This awarded on October 25, 1784. This is how many Haudenosaunee people came to live along the Grand River, and partly how the Six Nations Reservation came to be. Many traditional structures were threatened among people of the Six Nations with the allotment of reservation lands in 1840s. From 1869 onward, Canadian law required a mandate of paternal descent. In 1924, the rule of the traditional confederacy chiefs was terminated/forcibly removed in favor of an elected municipal government on the reserve. This is currently the only governing body on the reserve recognized by the Canadian government. In 1959, and again in 1970, the confederacy chiefs and their followers attempted to seize control of the Six Nations government, but failed. On the whole, the abolition of the matrilineal decent system of the Iroquois has caused much confusion among the Six Nations, throwing nation and clan membership into doubt for many people unable to trace their family history back. Another threat to Six Nations culture was that of residential schools- governmentally instituted boarding schools to which children (often) were forcibly removed from their family home were sent. Often religious in nature, these schools were places of assimilation of aboriginal children, demonstrating the government’s policy of eradicating indigenous culture. Survivors of these schools report having been beaten for speaking their native languages, practicing Haudenosaunee ceremonies, etc. the last residential school in Canada was closed in 1969. The Mohawk Institute Residential School in Brantford- also known as “the Mush Hole”- to which the children of the Six Nation reserve were sent, closed-in. This is the current site of the Woodland Cultural Center. This Residential school was open 1828-1969, approximately 1, 400 native children attended throughout this time. Legal proceedings are currently in action to compensate victims of residential school mistreatment. Despite the recent social and governmental problems the Six Nations Reservation has had, there are many new remedial steps being taken everyday. Programs are now in place to save the Haudenosaunee languages, some of which are in danger of becoming extinct. On the Six Nations Reserve, several schools such as Kawenniio Gaweniyo Private Elementary and High Schools, and I. L. Thomas Odadrihonyanihta Elementary offer Haudenosaunee language immersion programs. The Grand River is approximately 300 kilometers long from mouth to source. Around the Six Nations territory, the river has a clay bottom, and may appear muddy and polluted. However, the Grand River is one of the cleanest in Ontario, and has been designated a Canadian Heritage River. There are twelve Grand River Conservation Authority Parks along the river. Canoeing, kayaking, fishing, dinner cruises, and watching the wide variety of wildlife can be enjoyed on the Grand River. There are many types of fish in the river, including smallmouth bass, walleye, pike, rainbow trout and catfish. However, many introduced species, such as carp, are threatening the indigenous river ecosystem. The Grand River is naturally an area of Carolinian Forest, which includes fewer conifers, more deciduous and a lot of hardwoods, such as red and white oak, ash, elm, chestnut, butternut, hickory, black walnut, maple, white pine, some birch, poplar, and willow. Introduced species of plants are traditionally a farming people. “The Three Sisters” or “Our Supporters” consist of corn, beans, and squash, three traditional staple crops. Traditionally, many of the local plants may be used medicinally as well. There are many famous people who come from Six Nations whom you may have heard of. Some of these include Jay Silverheels, Graham Green, Gary Farmer, Sadie Buck, Santee Smith, Joseph Brant, Robbie Robertson, Stan Jonathan, Gaylord Powless, Tom Longboat, and Emily Pauline Johnson. Short biographies of the latter two figures are included as follows. Thomas Charles Longboat was born on July 4, 1886, Six Nations Reserve. Early in his life, it became clear that Longboat that has ability to become a great runner. Longboat’s first important race took place in 1906 when he won the “Around the Bay Race,” an annual Marathon in Hamilton, Ontario. After taking his victory, it is said that Tom ran home after the race. When he won the 1907 Boston Marathon with a record time of two hours, twenty-five minute and four second, Tom Longboat became the world’s premiere marathon runner. By 1910 he was widely recognized as one of Canada’s leading athletes. In 1912, after turning professional, he set the record of one hour, eighteen minutes and ten seconds for fifteen miles-seven minutes faster than his old amateur record. During World War I, Longboat served as a dispatch runner in France and raced professionally as often as possible. After the war, Longboat returned to Canada and settled in Toronto. He retired to the Six Nations reserve and died of pneumonia on January 9, 1949. Tom had become a legend in his own lifetime and so he shall remain. One of the many tributes to him is the “Tom Longboat Trophy” awarded annually to the outstanding native athlete across Canada. In 1955, six years after his death, Tom Longboat was installed into the Canadian Sports Hall of Fame. Tekahionwake or E. Pauline Johnson was the daughter of a Mohawk Chief, George Johnson, and his wife Emily S. Howells, and Englishwoman. Pauline was born on March 10, 1861 on Six Nations. Although Pauline received little formal education, she seemed to have a natural aptitude for literature and began to write poetry at an early age. At the turn of the century, Pauline Johnson was one of Canada’s most popular and successful entertainers. At the age of 31 when society expected her to marry and begin a family, she began to tour the country instead. She gave popular recitals of her poetry, comedy routines, and plays from Halifax to Vancouver. She was also one of the few female writers at the time that could make an independent living from what she wrote and performed. Pauline Johnson was proud of her native heritage and wrote: “My aim, my joy, my pride is to sing the glories of my people.” Pauline Johnson died in Vancouver on March 7, 1913 in Vancouver, British Columbia. Her childhood home has become the Chiefswood National Historic Site. The original formation of the Six Nations of the Grand River First Nation dates back to the 16th century, with the founding tribes of Seneca, Cayuga, Oneida, Onondaga and Mohawk uniting to form a powerful and organized allegiance. In 1712, the Tuscarora Nation was invited to join the league, and they were widely known as the “League of Six Nations”. Distinctly of Iroquoian descent and hailing originally from New York State, settlements formed in and around the Great Lakes regions of Ontario, most notably, northern Lake Ontario. The League of Six Nations gave birth to one of the earliest forms of democracy, governed by a council of fifty chiefs, elected by the female elders or “Clan Mothers” from each respective Nation. The Six Nations were governed by a constitution, known as “Gayanashagowa” or “The Great Law of Peace”. Their successful political structure would influence future European, U.S. and United Nations political frameworks. Unique to the Iroquois Six Nations were their dwellings, known as “longhouses”, rectangular wooden structures, built to accommodate extended families of 50 or more. Communities were barricaded by tall protective fences. The main source of economy was agriculture, namely beans, corn and squash, supplemented by fishing, hunting and gathering. Amidst European immigration and influence, the original League of Six Nations experienced an intensely volatile history involving French and Dutch trading wars and conflicting allegiances to the British Crown amongst the Nations. “Mourning War Raids” were traditionally practiced by the Iroquois, consisting of the symbolic replacement of lost warriors gained through raiding of conquered tribes. Young men and children were systematically seized and integrated into the social systems of the Iroquois people, adopting and educating the newcomers as their own, without distinction. The formality of land agreements representing the Six Nations of the Grand River First Nation is complicated and controversial, with negotiations ensuing to the present day. In 1784, the original reserve land was issued by Frederick Haldimand, signed to the Haldimand Proclamation, to reward Iroquoian support to the British Crown. By 1842, approximately two-thirds of the original reserve land was lost to sales, leases, surrenders and squatters’ rights. Original land treaty agreements were recorded by Iroquois leaders in the form of beaded “wampum” belts, some of which are still in existence today. Located in southern Ontario, approximately 25 km southwest of Hamilton, the Six Nations of the Grand River First Nation is the most populated First Nation in Canada, with a membership exceeding 22,000. Over 11,000 members live within the First Nation boundaries. Communities belonging to the Six Nations of the Grand River include Beavers Corner, Longboat Corners, Medina Corners, Ohsweken, St. Johns, Sixty-Nine Corners, Smith Corners, Smoothtown, Sour Spring and Stoneridge, covering a land area of 184.7 sq. kilometers or 71 sq. miles. The Nations of Mohawk (Bay of Quinte Mohawk, Lower Mohawk, Upper Mohawk and Walker Mohawk), Oneida, Onondaga (Bearfoot Onondaga and Onondaga Clear Sky), Cayuga (Lower Cayuga and Upper Cayuga), Seneca (Konadaha Seneca and Niharondasa Seneca) and Tuscarora reside within the two adjacent areas of Six Nations Reserve Number 40 and Glebe Farm Reserve Number 40B, formally known as the Six Nations of the Grand River First Nation. The Six Nations of the Grand River First Nation continues the tradition of functioning as a highly organized community. With the emphasis on respecting language, culture and the environment, a full roster of community oriented events are organized to encourage pride and participation within the Nation. The “Grand River Champion of Champions Pow Wow”, held annually since 1980, attracts over 400 dancers from across North America. Commencing in 1982, “Aboriginal Solidarity Day” has been celebrated on June 21st, in conjunction with Summer Solstice, including a potluck barbecue and outdoor concert. The “Annual Street Dance”, sponsored by community owned and operated radio station CKRZ 100.3FM, is held on the Victoria Day long weekend. 2007 marked the 140th anniversary of the “Annual Fall Fair”, featuring agricultural and community exhibits, horse-show, rodeo and pow wow, native crafts, midway rides and demolition derby. The “Miss Six Nations Pageant”, an annual beauty pageant, runs in September. The “Six Nations Native Pageant”, is an outdoor forest theatre operating through August, with performances depicting First Nations history. Traditional food and crafts are available throughout the pageant. The “Six Nations Elders Network” hosts the annual Wild Game Dinner, Strawberry Social and Fish Fry. “Ohwejagehka: Ha’degainage”, a non-profit organization located in Six Nations, was established to preserve and nurture Iroquoian language and song. Six Nations of the Grand River First Nation is a thriving and rapidly growing community. Between 1972 – 2005, overall populations, on and off reserve, have increased by more than 13,000. The “Six Nations Elected Band Council”, operating since 1924, has evolved into a fine-tuned organization, working in the best interest of all Nation members. The focused dedication to advancement and development are reflected throughout the community. As of 2007, the Community Planning Office began creating the “Six Nations Comprehensive Community Plan”, a twenty year plan that aims to meet and improve the needs and goals of the community. 2008 brought the confirmation of the addition of a 50-unit Elders Housing Complex sited for the Ohsweken area land. Six public schools, including “Six Nations Polytechnic”, offering training and education in environment preservation, and two separate schools, are part of the community. Outstanding achievements in high school academics are honored in November. The Six Nations of the Grand River support a highly successful lacrosse organization, boasting annual champions in the various leagues. More than a dozen churches, of varying faiths, are found throughout the community. The Nation is responsible for the maintenance and upkeep of a water treatment system, landfill, and volunteer fire department. Approximately 300 businesses exist within the Six Nations First Nation, with new ventures opening monthly. More than a dozen community based organizations operate off reserve, including a police service, library, housing, post-secondary education, and organizations aimed at preserving traditional Iroquoian language and artifacts. The original League of Six Nations set a precedent for its people in the respectful and admirable way in which its founding form of democracy was carried out. The present day Six Nations of the Grand River First Nation seeks to honor the intentions of its ancestors in providing the necessary tools for preservation and advancement of a proud and rich heritage. The people who are from this reserve are called the Six Nations in English, or the Iroquois in French. The Six Nations was originally made up of five powerful Indian tribes or Nations: the Mohawk, Onondaga, Seneca, Cayuga and Oneida. These five groups founded The League of Peace or Iroquois Confederacy , which governed with a council of fifty chiefs elected by female elders from each Nation. This system of government was one of the earliest forms of democracy. Its organizational structure was used later as the basis of the United States government and the United Nations. In 1712, the Tuscarora Nation joined the Five Nations. 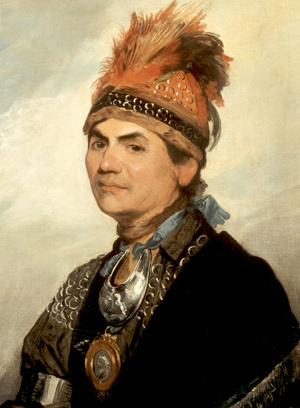 Led by Joseph Brant, some of the Six Nations people fought for the British against the Americans during the War of Independence. After the defeat of the British, they emigrated to Upper Canada, where the British Crown gave them a large area of land to replace land taken by the Americans. The original tract, recognized legally in 1784, covered an area of six miles on either side of the Grand River, from its source to its mouth, in what is now the Province of Ontario near the present towns of Fergus, Brantford and Kitchener-Waterloo. By 1828, two-thirds of this land had been lost to land sales, land leases and squatters’ rights. In 1842, the remaining land became recognized by the British Crown as Six Nations Indian Reserve Number 40. Six Nations of the Grand River was governed by the original form of government until 1924, when the Canadian federal government tried to replace the Six Nations system with a federally-recognized Band Council. Both of these governing bodies exist today. Indian Defence League of North America: the oldest continuous Native protest movement on Turtle Island. As a third generation activist perhaps people would like to know that idloa has been upholding the Jay Treaty of 1794 & the 1812 Treaty of Ghent since 1927. Clinton Rickard -a chief of the Tuscarora Nation, the Martins of the Six Nations Reserve along with my grandparents- Frank & Teresa Meness of Kitigan Zibi Anishnebeg organized the first march in 1927 after a fateful visit from a traditional Cayuga leader Levi General, Deskaheh, chief of the Younger Bear Clan. Deskaheh was one of the first to assert Iroquois national rights in an international forum, traveling to Geneva, Switzerland, in the early ’20s to petition the new League of Nations, forerunner of the United Nations. While staying at Chief Rickard’s house on the Tuscarora territory in New York, Deskaheh fell ill and sent for his traditional medicine man from the Six Nations Reserve in Canada. But the medicine man was not allowed across the border. The U.S. had just passed the Immigration Law of 1924, which denied entry to anyone who did not speak English. Although the measure was directed against Asians, it also barred the traditionally raised medicine man, who did not read or write English and only spoke his own language. He could not make it to Deskaheh, who passed away in Chief Rickard’s house. Rickard was so moved that he began the border crossings and devoted his life to defending the right of free passage for Aboriginal people This year marks the 83rd continous march across the U.S-CAN border. The celebration is held in Niagara Falls on the third Saturday in July – everyone is welcomed. My family be involved in “Indian Rights” since 1920 when my grandfather was requested to hide the wampum belts for the Algonquin Nation – a time when RCMP & the priests & the bootleggers were mandated to acquire – including using lethal force – all things aboriginal for museums & – lets be honest -personal wealth. It was no joke to be caught with sacred items- you were shot for holding onto family & community items. You were thrown in jail for “talking” about Treaty & Aboriginal Rights & or stripped of your right to lead your people by a stroke of the pen held by the Indian Agent – which happened to my mother’s grandfather when he supported my grandfather on my father’s side by refusing to shut up about T&A rights at the band meeting. When my grandfather died in 1971 I was 7 yrs old & I remember the RCMP busting down my grandmother’s door & questioning her about the location of the belts. They came back a number of times …. Eventually a meeting of the idloa was had & it was decided that the belts would be passed onto William Commanda for safekeeping..
which details both Canada’s & Quebec’s historical truth dealing with my people. both available from Anishinabe Printing listed above. “When we walk upon Mother Earth, we always plant our feet carefully because we know the faces of our future generations are looking up at us from beneath the ground. We never forget them. Hello Donna. Thank you for the extensive comments. If you would like to submit something original as a guest post, please let me know. Printed in full – no pictures though..
“On July 4, American Independence Day, the Queen of Canada, as Prime Minister Stephen Harper called her throughout her recent visit, attended a Sunday morning service at St. James Cathedral in downtown Toronto. Four days after Canada Day, the choice of a service at St. James, one of the most visible manifestations of Toronto’s increasingly atavistic ‘English connection’, was a reminder of the living presence of history. This was poignantly apparent in Queen Elizabeth’s personal decision (according to Kevin S. MacLeod, Canadian Secretary to the Queen) to present two peals of hand bells to the Chapels Royal of the Mohawks. In 1710, a Six Nations delegation visited the court of Queen Anne asking for her support. The first Mohawk Chapel was built in 1712 in the Mohawk Valley. Following the American Revolution and the defeat of British forces, loyalist Six Nations people were awarded a sizeable land grant in the Haldimand Treaty of 1784; and the first ‘Mohawk Chapel” was erected by the Crown in 1785. The relationship between Crown and some Iroquois was enhanced by the continued loyalty of Grand River people during The War of 1812. The present day Mohawk Chapel, renovated in 1983 in Six Nations territory on the Grand River, is the only Royal Chapel in North America. It was so designated in 1904 by Edward VII. As a historian, one is struck by Elizabeth’s choice of July 4 as a date to commemorate the 300-year relationship between the British Crown and the Mohawk Nation. Further, given the contentious, sometimes even bloody, relationship between the Canadian state and the Six Nations since Confederation, the import of the Queen’s decision to pay such homage was not lost on the Mohawks present, or on attentive observers of indigenous-settler relations in Canada. To understand the political relationship between the Iroquois Confederacy and Colonial America, requires an understanding of the Covenant Chain concept. The Covenant Chain was an ongoing set of councils and treaties between the English colonies in North America and the Iroquois Confederacy. These treaties and councils covered such contentious matters as trade, settlement, and the resolution of episodes of violence between Colonial-settlers and the Iroquois. The Covenant Chain operated from the late 17th century until the middle of the 1750s. During most of its operation, New York took the lead in representing the English colonies because most negotiations took place in the Mohawk Valley . The Covenant Chain broke down when representatives of the different colonies could not agree among themselves on a common position to take when meeting with representatives of the Iroquois Confederacy. After the breakdown in the Covenant Chain, the English Government stopped allowing local officials to negotiate state matters with the Iroquois and took a much more active role; dealing with the Confederacy as a sovereign Nation. As the dominant European powers in North America changed, the Covenant Chain was continually renewed with the Haudenosaunee. In 1755, William Johnson renewed the concept of the Covenant Chain at a council with the Iroquois, restating the symbolic meaning of that agreement, calling it the “Covenant Chain of love and friendship” He stated that the chain has been attached to the immovable mountains and nearly every year the British and Iroquois would gather to “strengthen and brighten” the chain. Treaty gatherings, such as the one that occurred at Albany in 1754, served to “strengthen and brighten” the covenant chain. You say that you are our Father and I am your son. We say, We will not be like Father and Son, but like Brothers. This wampum belt confirms our words. These two rows will symbolize two paths or two vessels, traveling down the same river together. One, a birch bark canoe, will be for the Indian People, their laws, their customs and their ways. The other, a ship, will be for the white people and their laws, their customs and their ways. We shall each travel the river together, side by side, but in our boat. Neither of us will make compulsory laws or interfere in the internal affairs of the other. Neither of us will try to steer the other’s vessel. The agreement has been kept by the Iroquois to this date.